December proved to be a good month for cycling: the warmer days often overcast, but the colder days crisply sunny. On one of the overcast rides to work, I stopped to snap this lovely view of the Potomac from Memorial Bridge. X-Mas morning dawned mild, and with no little children at home I was free to take a lovely ride along the Four-Mile Run trail, which is scenic and moderately hilly. Shorts and a hoodie were all the protection I needed. 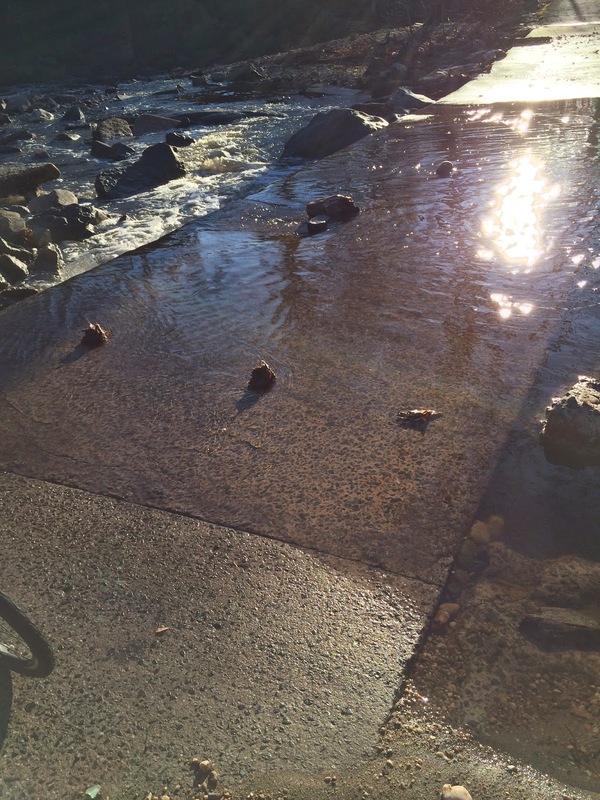 In the aftermath of heavy rains, the bridge preceding the steepest hill was overrun by inches of water, so I gladly diverted to the W&OD trail. I looped around the deserted shops at Shirlington, seeing only a disappointed couple rattling the locked doors of Caribou Coffee. I was glad I had my ride before a day of driving: first to Frederick for Jewish X-Mas (yup – Chinese food and a movie) with my child; and then, in the dark, to Philly to spend the weekend with the Cycling Yogi. Despite a rainy forecast for Sunday, the weather cleared up by 7 a.m. – so we headed for Valley Forge. The Cycling Yogi biked the entire 34 miles. I drove the first (and last) 7 miles and then biked the 20-mile round-trip flat section of the Schuylkill River Trail. The Cycling Yogi’s such a stud…he arrived at our rendezvous spot on bike just minutes after I got there by car (and on the way home – he beat me back!) The temperature in the low 50s was just right; we stopped at Valley Forge Park for a snack, and headed home with just the barest few sprinkles of rain upon us. I figured I would close out 2014 with a New Year’s Eve day bike commute to work. Despite the sub-freezing temperatures, I managed to work up a sweat. I don’t know if it was the colder temperature or the lighter-than-usual traffic, but I shaved 5 minutes off my normal commute time. 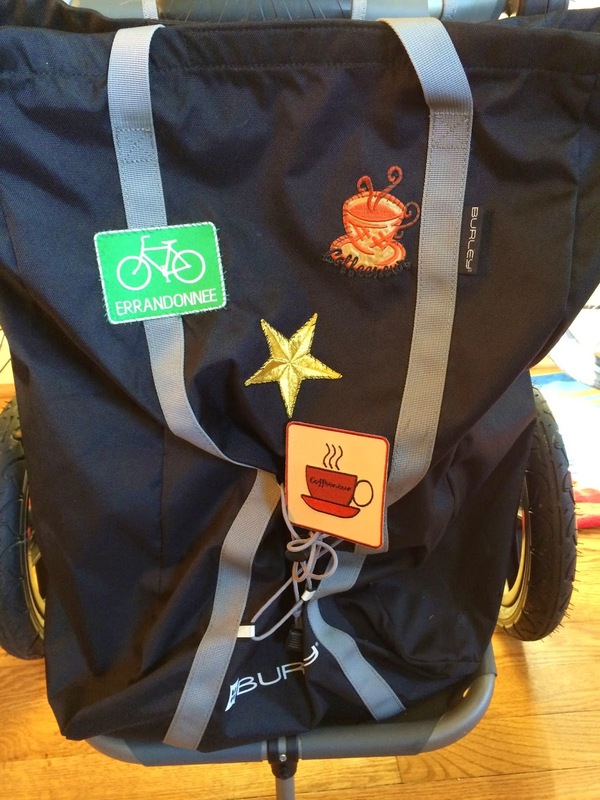 Got home to find my "coffeeneuring" patch in the mail and am contemplating where to place it on my bike trailer. Looking forward to another fine cycling year ahead…happy new year! I was blessed that Biking Yogini bought me a brand, spanking new bike last month, vintage 1990 from Arlington’s Old Bike Shop. It was a replacement for a bike stolen from in front of her office on my previous visit. Truth to tell, I never really felt good on it, and was not sorry to see it go. But I liked the new old bike from the first. It’s a city bike, straight handle bars and glass-resistant tires, as is my wont. 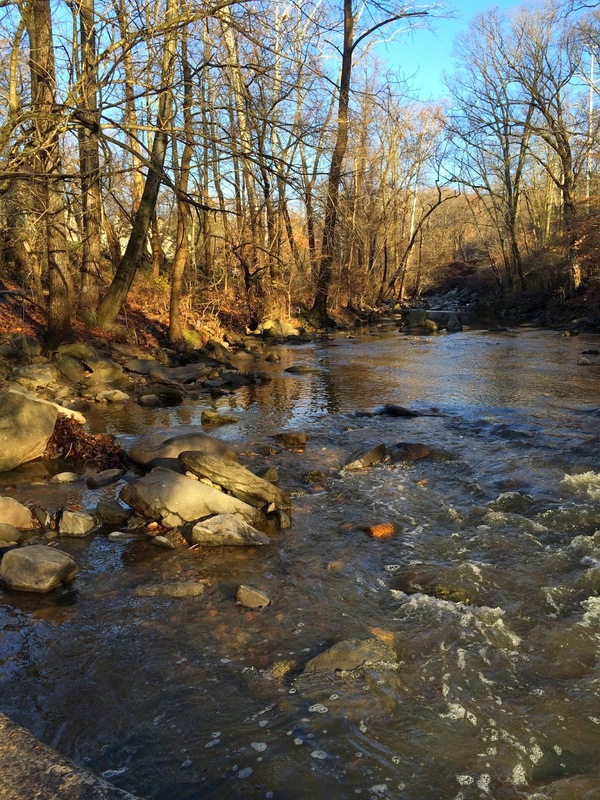 The next day I took it on the Capital Crescent trail, ten miles up to Bethesda. It felt faster, easier to pedal than the bike I’m used to at home in Philadelphia. I was surpised how zippy it was, but thought it unlikely that that extra energy could come from being on Day 4 of a water fast. Riding to the train station the following day, I noticed a wobble in the front chainring. not left-to-right, but forward and backward. Looking down, I could see the chain moves slightly out and in with each rotation. An elliptical chain ring! Maybe that’s why it felt so zippy. Early in the history of velo-sport, enthusiasts had the idea that the portion of the pedal cycle where feet are at top and bottom is a dead zone where it’s not possible to exert much pressure. Wouldn’t it be more efficient to design the chain ring to move quickly and easily through that part of the cycle, and provide extra resistance for the downward thrust? Thus was born the elliptical chain ring. The long diameter of the ellipse is perpendicular to the pedal arms. But in practice, cyclists never liked them very much. They felt harder to pedal, not easier. In time trials, they didn’t seem to improve pedaling efficiency. And, worst of all, they seemed to be associated with injuries. There was a characteristic whiplash of the knee that came from the quick reversal of direction at the bottom of each pedal stroke. Through the years, the elliptical rings were brought back by different companies in different variations. Later models were less extreme, closer to circular, but they never caught on. The old knee problems persisted. The late 1980s were the dawn of computer-aided design, and innovative engineers at Shimano in Japan took up the problem and determined to do it right. Their curiosity was sparked by the persistent finding that cyclists preferred round chain rings to elliptical, and they thought: maybe a reversed ellipse would be even better. What would happen if we rotated the ellipse 90 degrees, so there is increased resistance in the “dead zone”? The best thing they did was to keep an open mind. They tried lots of different ring shapes with lots of different cyclists. They asked for subjective impressions, and also measured performance in long rides and in sprints. Out of their research came the Biopace chain ring. The widest part of the ellipse is almost aligned with the pedal arms, rotated about 80o compared to the version that had failed repeatedly. The Biopace was an engineering success, but a marketing fiasco. The literature was over-hyped and over-explained. Too much information. There were no knee injuries, but Biopace never caught on, and in 1994, Shimano stopped producing them. I was home in Philadelphia, away from my beloved new bike, but I emailed Yogini and asked her whether the wide part of the ellipse was aligned with the pedal arms or perpendicular. She sent me a photo that confirmed my suspicion that I had been riding Biopace. I wondered if I could retrofit my Philadelphia bike? Though Biopace hasn’t been manuractured in 20 years, there is an aftermarket on Ebay. I counted the teeth of the large and middle chain rings on my Astral 700. 52-40. I found a set of chain rings that matched close enough at 52-42, and from the picture, the 5-point mounting looked to be compatible with what I had. I lost the first bid, but I was the only one bidding on the second. They arrived a few days later, $16 included postage. I have never monkeyed with a front chain ring before, but I thought I’d try to install it myself. It took an hour and got me thoroughly greasy. 5 Allen lugs for each of the two rings. The hard part was that the Allen lugs fit just barely between the teeth of the next smaller chain ring, and each one took some wiggling and jiggling to get it into the hole. The front derailleur had to be moved ¼" higher because it rubbed against the chain when the ring reached its widest point. I attempted this on my own, but must confess I took the bike into the shop for final adjustment, to keep the derailleur from rubbing. It works. I have two zippy bikes, with brand spanking new 20-year-old chain rings. After a bit of Halloween candy indulgence, and with cold rain in the forecast, I decided to venture out on the early side in search of a new coffee venue. 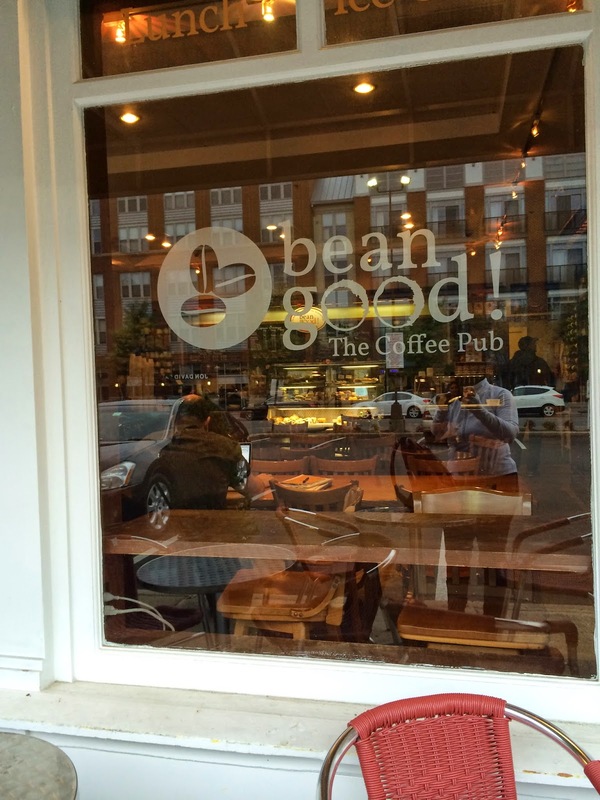 One day last week, as bike and I were headed home on the bus from Rosslyn, I spied a new-to-me coffee shop, Bean Good, right next door to the Rosslyn branch of the D.C. icon: Ben’s Chili Bowl. I took the city route, correctly predicting that there would be little traffic. With a base layer of smartwool, a wind-resistant outer layer, wool socks, balaclava, and full-finger gloves, I was dressed for the weather. I’m always happy to find the right combination of cold weather and clothing. It’s a fine art to balance the layers needed to avoid discomfort without overdoing it and ending up sweaty. 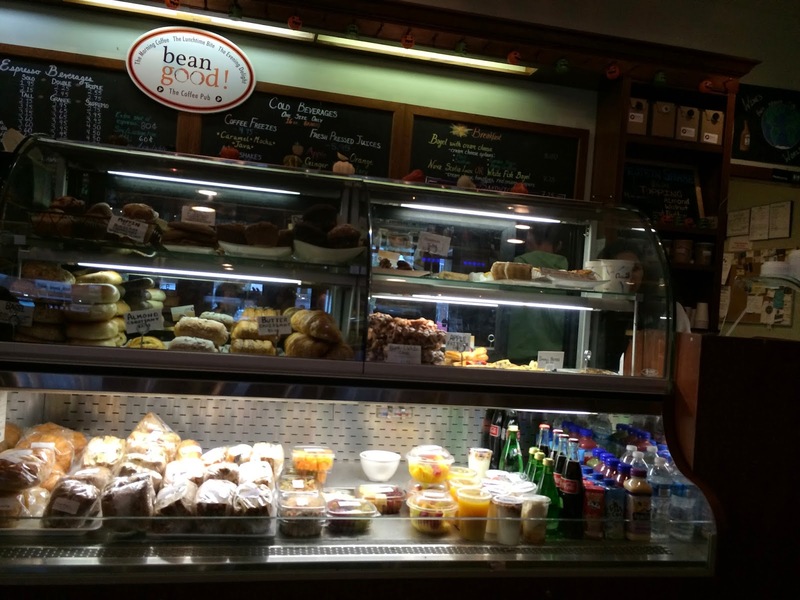 The “coffee bar” was surprisingly spacious, with a full array of pastries and such and a whole wall of wine to go – if that’s your thing. I ordered a one-shot macchiato, got a double (strangely in a paper cup – even though I was staying to drink it). It was a bit sour for my taste and required extra additions of milk. But the shop was doing a brisk business, so the locals must like it – despite its lack of a bike rack. Fueled by my double shot – I breezed home in no time, glad to have had an energetic start to my day. Yesterday the challenge was to get into gear for the real cold. My I-phone registered 34 degrees, but once I suited up properly the ride was actually quite pleasant. First stop was Pilates and then, on the way home, I got free coffee at the Heidelberg bakery, where I’d stopped for a loaf of my favorite 3-seed bread. It really doesn’t count as coffee, but being able to add it to my list helped motivate me to get out on the bike. For pretzel fans, Heidelberg featured pretzel bread and huge pretzels, the size of pizzas. And with that, I complete my official coffeeneuring for another year. I had intended to ride into DC one Sunday to try the Ethiopian coffee ceremony, but that will have to wait for another time. The lengths a crazy bike enthusiast will go to to enhance her coffeeneuring challenge may surprise some readers. But is not the spirit of the challenge to encourage riders to try new things and pursue adventure on two wheels? I flew to San Francisco on Sunday and drove with the Cycling Yogi to Monterey for a visit with his 92-year-old mother. She lives in Pebble Beach, just off one of the country's most magnificent roads: 17 Mile Drive. 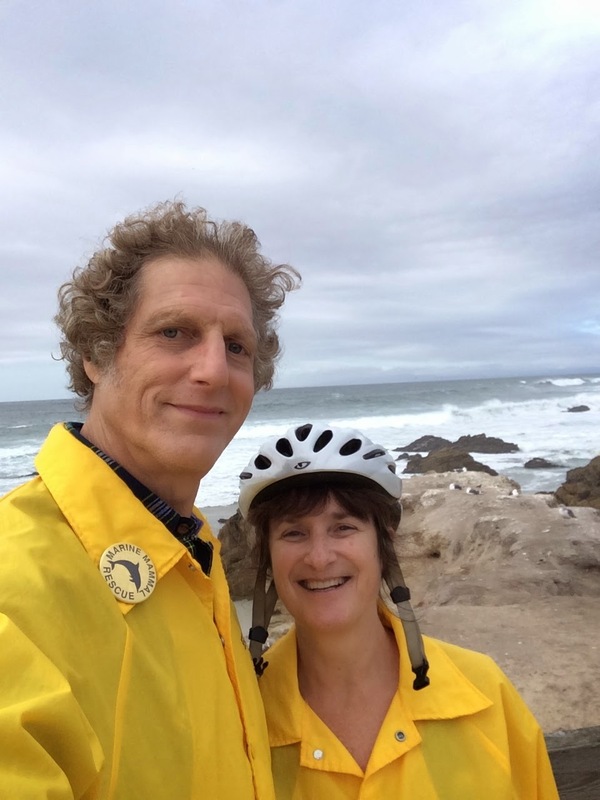 His mom borrowed a bike for me, and the Cycling Yogi already had a vintage Schwinn in her garage (see his guest blog, posted 9-23-14). 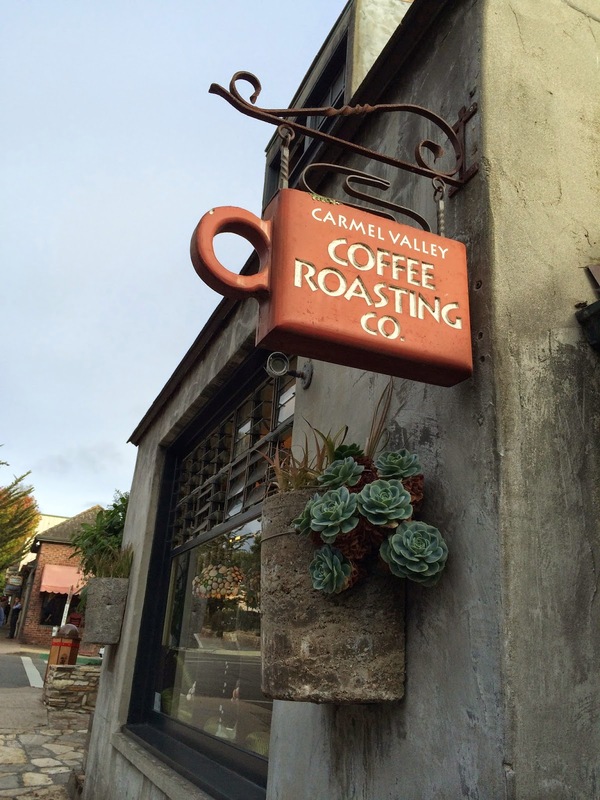 So on Monday afternoon we rode from her house to Carmel, where I had found the Carmel Coffee House and Roasting Company, boasting the area's best coffee. 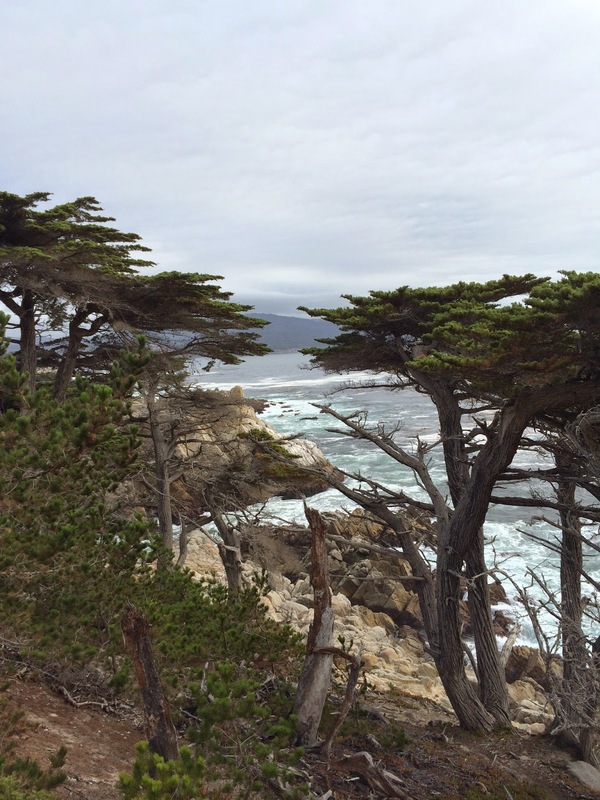 But I hardly needed an incentive to ride the hills along the ocean, stopping to see (and hear) the seals on Seal Rock, to take in crashing waves and windswept pines, and to glimpse a red headed woodpecker. The hilly terrain was enjoyable because every up had a down...none too extreme...well, almost none. The least favorite part was the last mile or so, which became very trafficky. 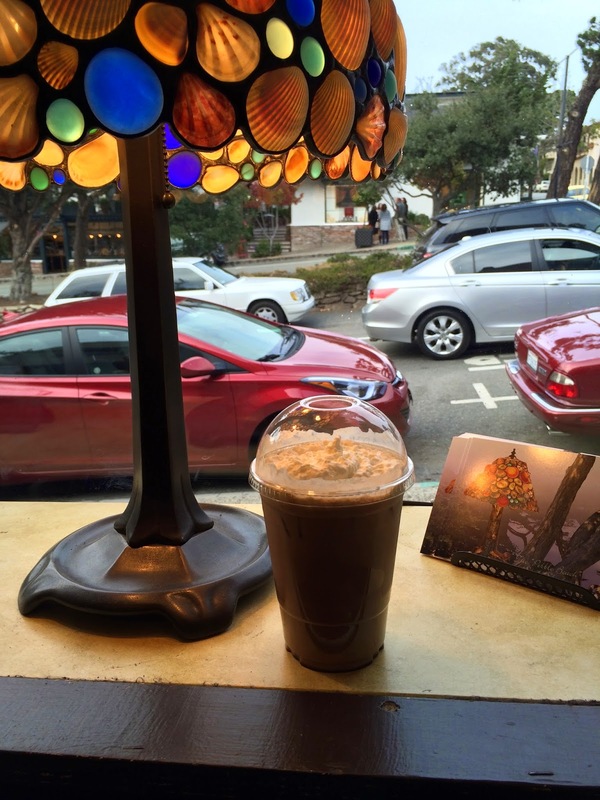 Once we entered Carmel, I had to walk my bike up the few steep blocks to the coffee shop, where I enjoyed an iced mocha (with just a bit of whipped cream), having worked up quite a sweat - even in the high-60s temperature. On the long stretch down into Carmel, I correctly predicted that I'd have to walk back up, but the rest of the return was smooth pedaling, taking the slightly shorter inland route...still beautiful. On Wednesday, after a day hiking in Pinnacles National Park, we returned to San Francisco, where I had a few days of work, followed by a mini-vacation continuation. 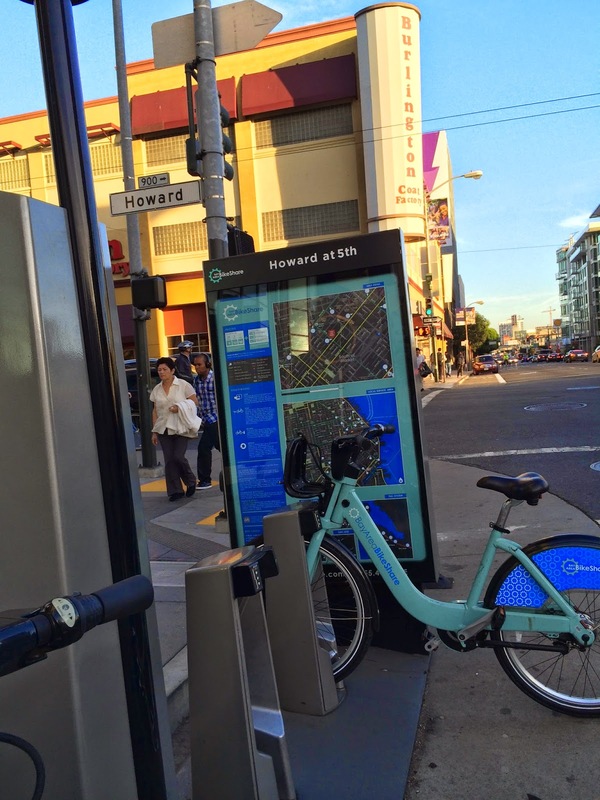 I had two goals for my first-time SF bike experience...to try the Bay Area Bikeshare, and to ride "the wiggle" - an east-west route that avoids climbing the hills for which SF is so famous. 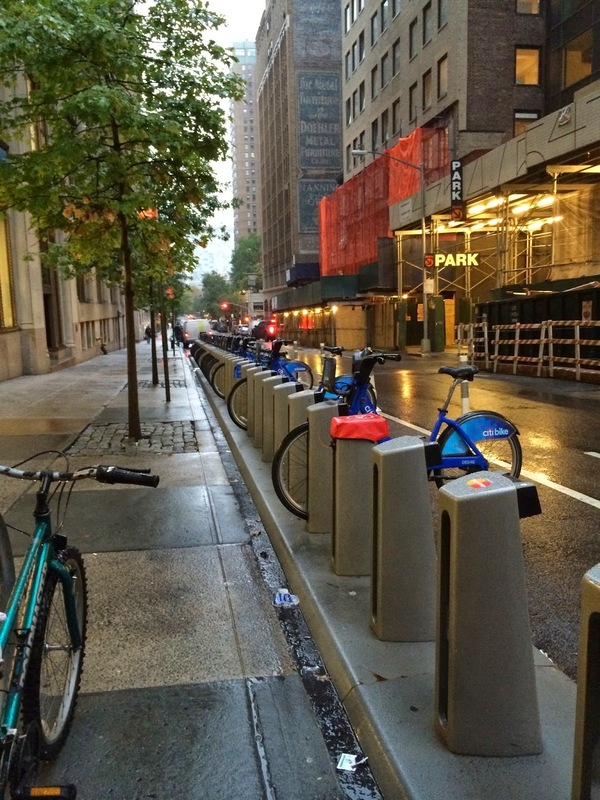 I had checked out a Bikeshare the previous afternoon to get a preview. My big mistake was making my foray during downtown rush hour. It was one of the first times I concluded that I would rather have walked than biked. How sad is that? To its credit, the SF bike shares have 7 gears (most cities have only 3) and they proved adequate for the hills I tackled on my first ride. The challenge was going up hills punctuated every block by traffic lights. I'm used to climbing my biggest hills on bike paths...not having to stop and start. Hats off to SF cyclists who are up to stop-and-go hill climbs! 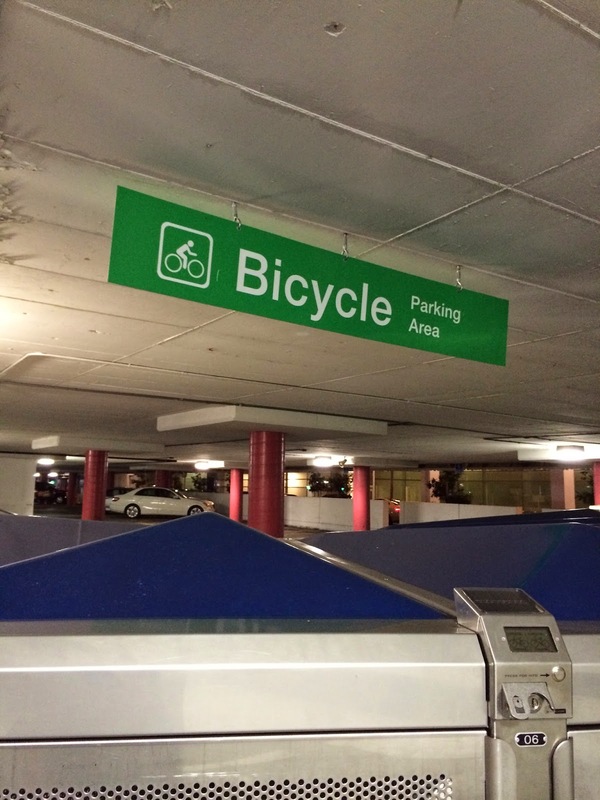 In the large public parking garage near the Moscone Center, I happened to spy protected bike parking. 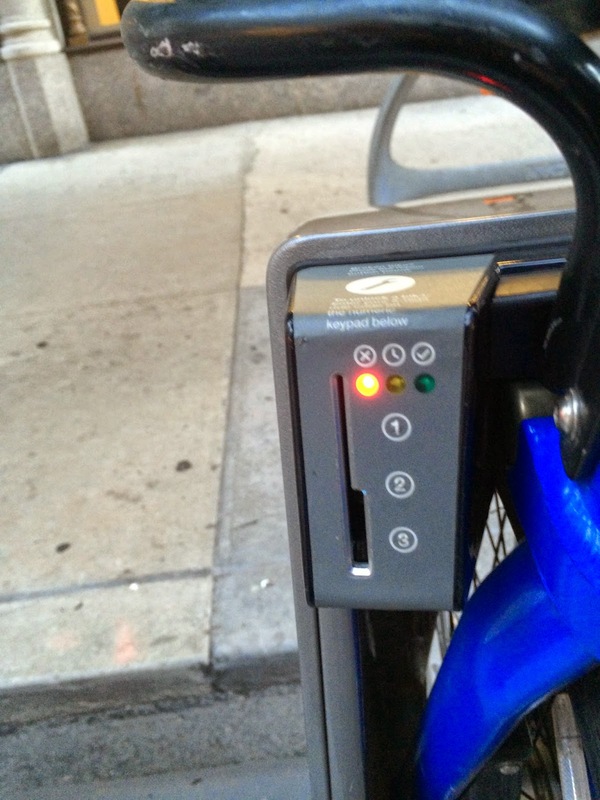 If you have a fancy bike, the very modest 5-cents-per-hour charge for a locker seems like a good investment. San Francisco has one of the highest cycling and bike commuting rates in the nation. This astonishes me, not only because of the terrain, but because of the grossly inadequate infrastructure. 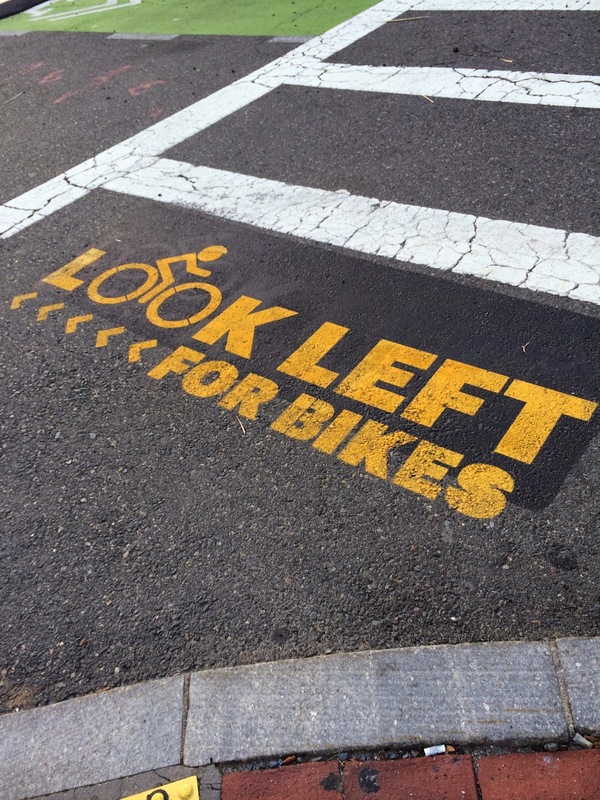 In my brief experience, I observed sharrows on busy streets and almost no dedicated lanes. Traffic is clogged and drivers are aggressive and impatient. 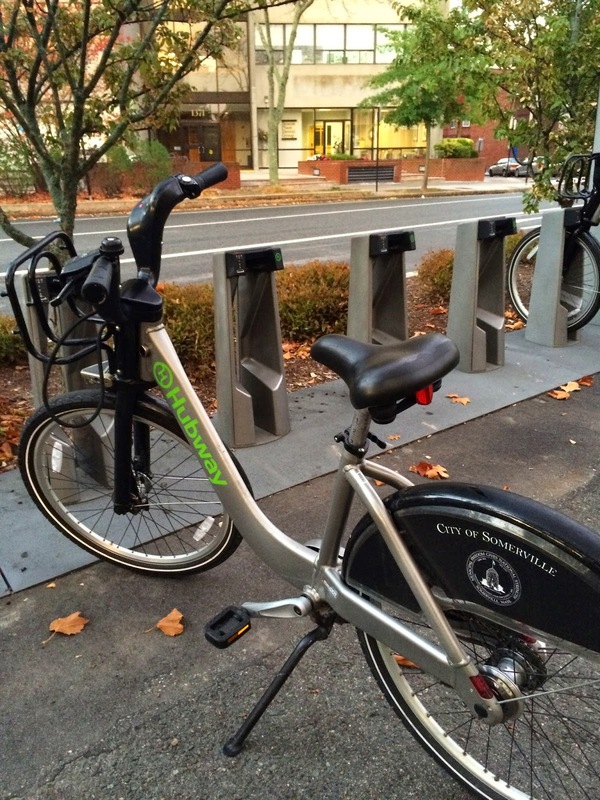 A big problem with the Bikeshare system is that it only operates in a tiny section of the city, so it's hard to find docking stations close to one's desired destination. After my first short ride, I docked and walked, which took me past the fanciest upscale coffee boutique I've ever seen: Nespresso. 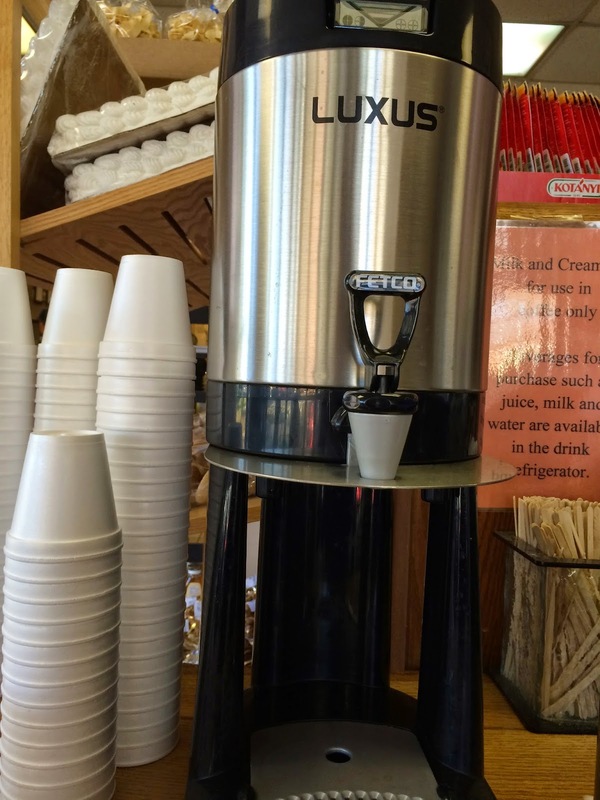 I took a photo, but was turned off by its sleek glamour, and was not in the mood for a $5+ coffee. 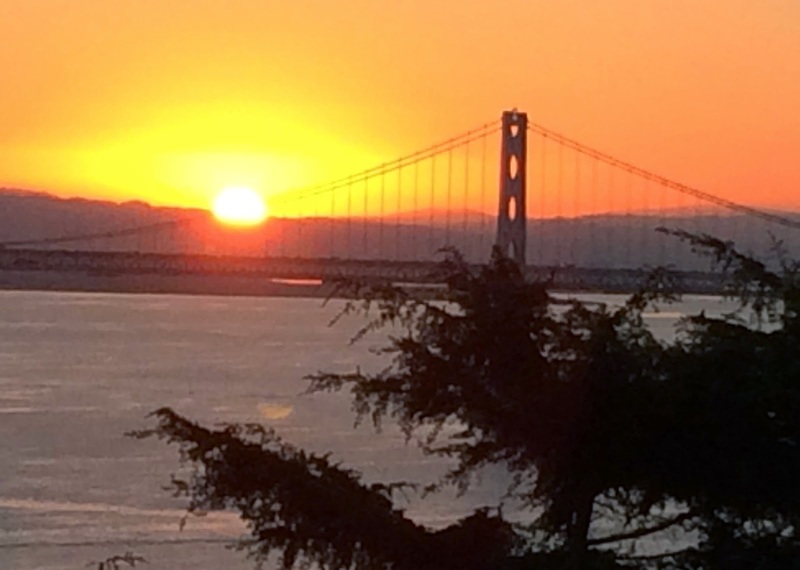 The next day, in the dark of early morning, the Cycling Yogi and I walked from our SoMa hotel to the Coit Tower, where I captured the sunrise over the bay and we got some private instruction in Qi Gong and Tai Chi from a local practitioner. It helps that the CY speaks Chinese! From there we walked down the Filbert Steps, where we nabbed the last two bikeshares in the nearest dock. We rode along the Embarcadero, which had the skinniest bike lane I've ever seen...proving that you can be too thin...certainly if you're a bike lane! But the coffeeneuring trip was scheduled for the afternoon. 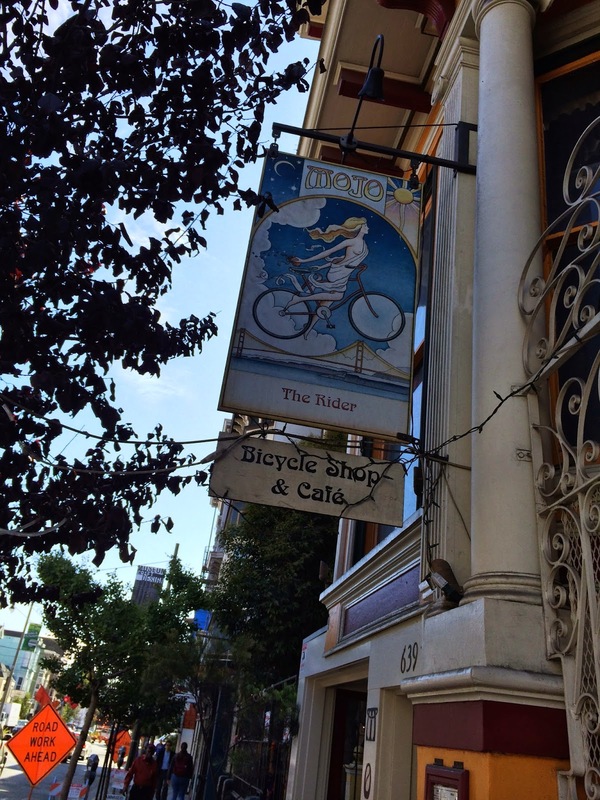 We rode down Market Street to where the wiggle begins - behind the Safeway at Duboce Park. On our way, I chatted up a nice young cyclist as we made our way out of the busiest section of Market St., and he told us there would be a dedicated lane and less traffic soon. Even once we got to the wiggle, there was a lot of traffic, but indeed, the route was quite level, despite steep hills all around us. The route was clearly marked with green bike sharrows, painted at close intervals on the roads. Cute little "bike highway 30" signs also were posted frequently. We ended at the panhandle of Golden Gate Park. Had we not been on bike shares, which charge up the wazoo for rides over 30 minutes, the park would surely have provided a nicer place to pedal. But we turned around to stop at Mojo Bicycle Shop and Cafe for our liquid refreshment...just a few short blocks (and one modest hill) off the wiggle. Bringing our bikes inside was no problem, and I ordered an iced Thai Tea - a slightly sweet, rather orange-tinged, cream-laced concoction, which provided a tasty and refreshing treat. The Cycling Yogi did not enjoy the SF bike infrastructure, noting that he feels much safer riding in his home town of Philadelphia, or in my DC/Arlington area. I'd have to concur. In addition, I had numerous glitches with docking station malfunctions. After returning my bike, I repeatedly got text messages exhorting me to return my overdue bike. I'm now BFFs with the consistently friendly and helpful customer service staff at Bay Area Bikeshare, who repeatedly checked their computers and promised to remove any overdue charges from my credit card. Also, the CY informed me that the Bikeshare seats were not scrotum-friendly...something I am incapable of evaluating on my own. But all-in-all, I enjoyed getting to know the Golden Gate city by bike. The weather was glorious, and I got to coffeeneur on a Friday, since I will be flying back home all day Saturday. This morning required a quick adjustment to East coast time, as I had to get to the yoga studio by 9 a.m. to teach my two Sunday morning classes. With the beautiful October weather, I added some "errandaneeing" to my coffeeneuring. From yoga I cycled to Clarendon, where I was picking up a new set of glasses, then on to Trader Joe's for a pound of coffee and some tea. I try to avoid the big chain stores for my coffeeneuring adventures, but my home supply of beans was not going to last the week and TJ's was on the way home. I selected an organic, fair trade, blend. I added some extra hills to make stops at the ATM and post office before returning home for lunch and preparations for my return to work. The wind, my God, the wind. For the last 7 miles I felt like I was in one of those endless pools where you swim and swim and don’t get anywhere. I was pedaling and pedaling and had to keep downshifting to make progress. But let’s back up. I knew that Saturday would be a lovely autumn bike day and decided to ride the “Arlington loop” – a 17-mile circular route that has the best of all worlds. I live in the Westover neighborhood (see the black line to the left of the loop, below), less than a mile from three great bike paths: the Custis, the Four Mile Run, and the W&OD. To ride the loop, I start with the Custis and go clockwise. This allows me to ride the more downhill portion of the Custis and return on the flat W&OD. Also, I can ride the first 12 miles and stop in Shirlington (about 6 o'clock on the map) for a snack – or a hot beverage if I’m coffeeneuring. 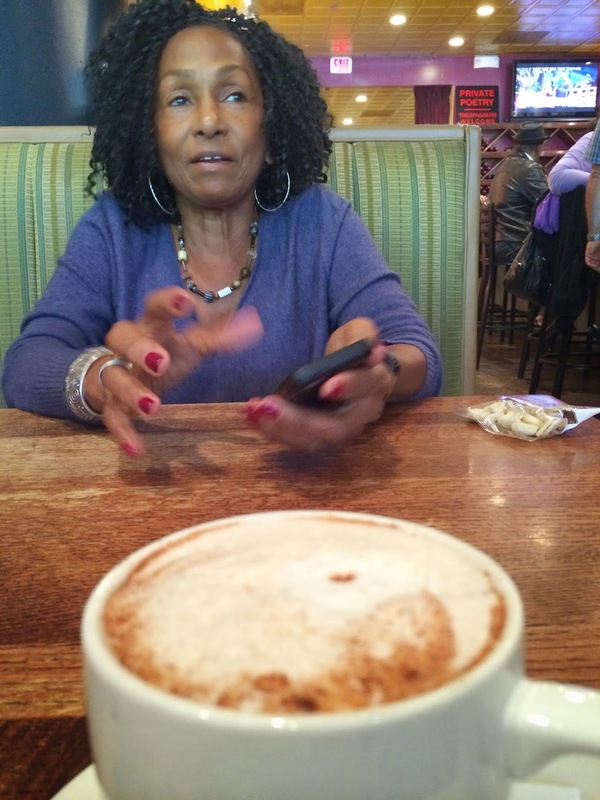 Busboys and Poets was to be my destination. 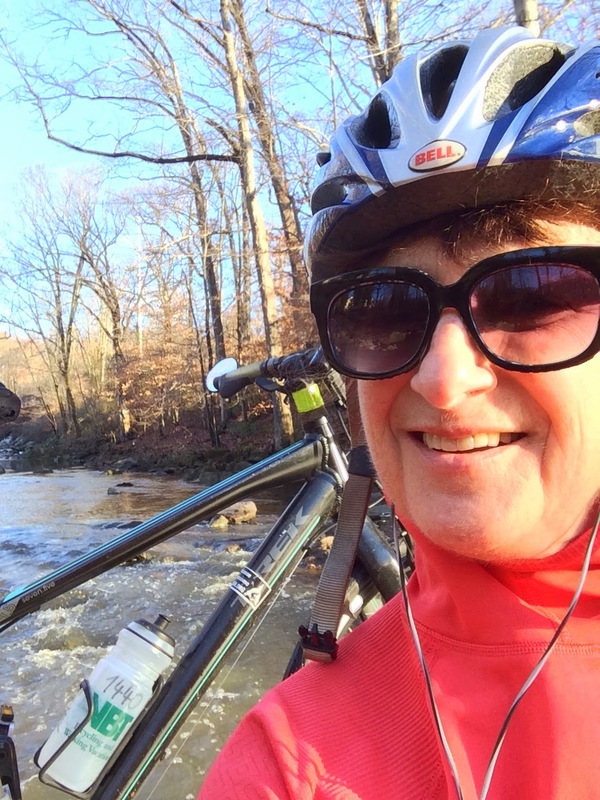 I called my friend Gayle in the morning and she was up for riding with me; we arranged to meet by the Big Wheel Bikes just off the Custis Trail. But so much for plans. She called and said the brand new tire on her bike was flat and wouldn’t hold air, but she was still up for meeting at BB&P. The Mt. Vernon Trail was pretty crowded, but I managed to make good time. Once I joined up with the Four Mile Run Trail I just barely missed a black snake that was slithering off the path toward the grass. This was when the wind began, but I had the motivation of lunch, so I forged ahead. Gayle and I had a lovely leisurely lunch, which I capped off with a soy chai latte – sweet and tasty enough to qualify as desert, with lots of cinnamon. Even though the end of the loop is then just 5 miles to home, the wind was fierce and I had to ride directly into it. But I felt well exercised, well fed, and happy to have caught up with my friend. Tomorrow morning I fly to the West Coast for vacation/business. I have already scoped out some options for Cali-coffeeneuring – so stay tuned! As luck would have it, the beginning of the 2014 coffeeneuring challenge coincided with a trip to New York. As I did last year, I made it a goal to avoid chains and seek out the independent coffee shops. Fate smiled kindly on me: when I Googled “independent coffee shop NYC” I discovered a recent NY Times article about the emerging coffee culture in the city. Once I identified the most appealing shops, I had to check for early morning openings on Saturday and Sunday, and then find proximity to a Citibike docking station. Saturday morning dawned drizzly, but that was not going to deter me. I grabbed a bike at 32nd and Park, near the very shabby (and definitely not chic) Community Church of NY lodging that constituted my NY digs and headed downtown on the 2nd Ave protected bike lane. 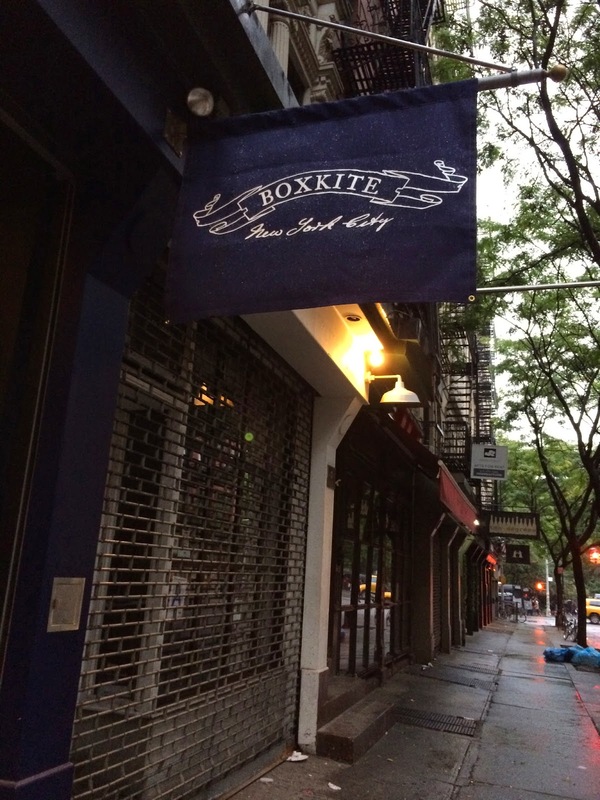 My destination was Box Kite on St Mark's Place, which opened at 7 and had as its specialty the "one and one" - an elegant preparation for the true connoisseur. Using single-harvest beans, the double-shot espresso is split into two preparations: a straight shot in one cup and a thick, creamy elegant macchiato in the second cup. Nestled between the two little cups is a little glass of sparkling water and a tiny cookie - reminiscent of my recent trip to Vienna, where the outstanding coffee is always accompanied by a glass of water. I have never tasted anything like the preparation, which was sour and green tasting, but packed with flavor. 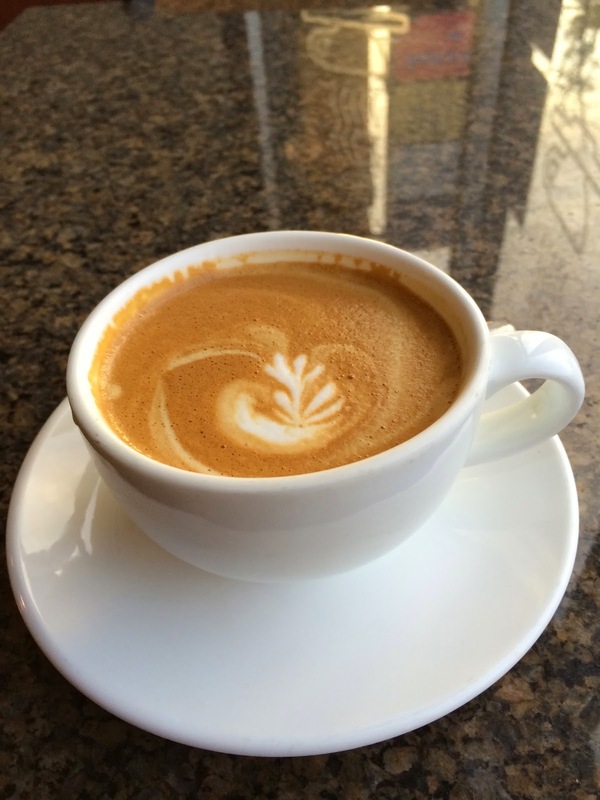 On its own, it was incredibly intense; as a macchiato, it was a delight. Tiny sips alternated with the water and nibbles of cookie made for a memorable and unique coffee experience. My server informed me that the coffee was Kirura from Kenya, and roasted by Mad Cap. I think he could have given me the names of the folks who harvested the beans, if I'd asked! He wanted to know how I liked it. I said it was not an every day coffee, but was wonderful for a special treat, and he heartily agreed. I had planned to ride back and pick up bagels at my favorite - Ess-a-Bagel - but alas, they were closed for Yom Kippur. I suppose I should have been fasting myself, but a book group reunion in NY gave me an excuse to skip the fast this year. Finding an independent coffee shop that was open at 7 on a Sunday morning was more of a challenge; I had to be back in my room close to 8, as I was catching a 9 a.m. train. Also, cheapskate that I am, I wanted to use my same 24-hour Citibike rental, so my ride had to be completed by about 7:40. As a side note, the Citibike app very conveniently allows the user to add coffee shops to the map. However, early on a Sunday morning the bikes have not been redistributed, and a number of locations were either empty or full. Nevertheless, I had everything planned out until I hit a glitch. 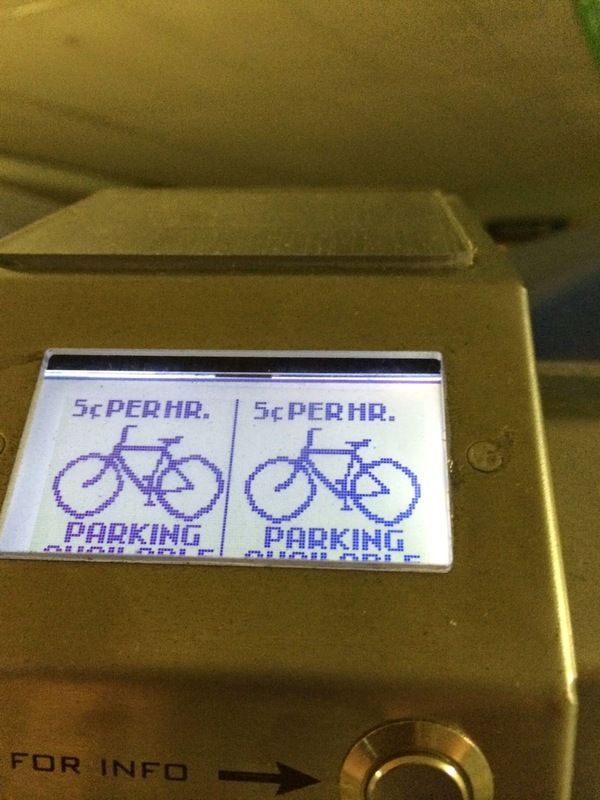 The station nearest me gave me an unlocking code, but I tried two different bikes, and it would not let me remove a bike. Thinking I had, perhaps, remembered the code incorrectly, I tried to get another one. But, of course, the user must wait two minutes for a new code. I didn't have time to spare, so I elected to walk to the next location, where I was able to secure a bike and ride to 47th street. 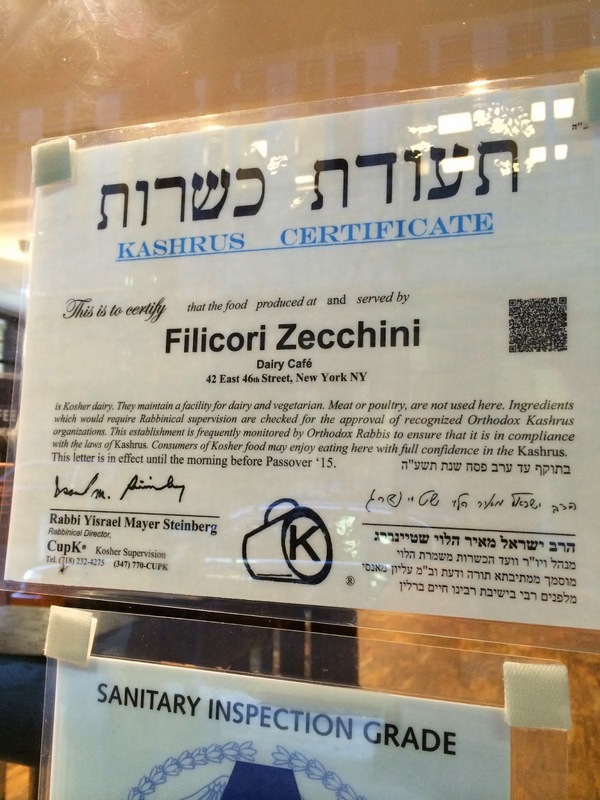 I had planned to walk west to Gregory's, which also made the NYT review, but a block sooner I saw Filicori Zecchini, which was just opening its doors. 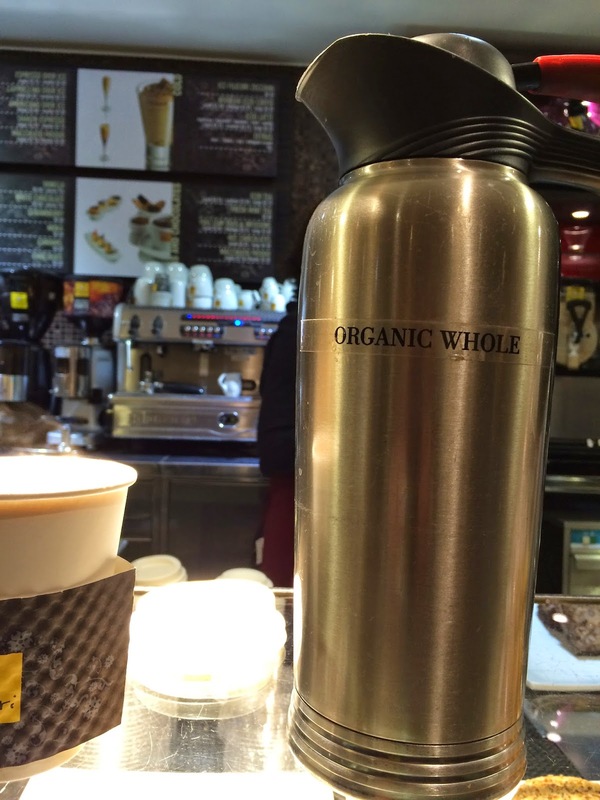 So I opted for a redeye with kosher organic milk, which was quite good, although nothing exceptional. Bonus ride - I always seem to have a lot of travel during coffeeneuring season, and I suggest that any time the cyclist is away from home should be a coffeeneuring opportunity, any day of the week. I have an annual meeting in Brookline, MA, so I already knew that my hotel would be right across the street from the Coolidge Corner Hubway station. But what a thrill to search for the best independent coffee shop in Boston and discover that the winner was just a mile away, and a block from another Hubway station. At 6:45 the sky was getting light and it was already a balmy 61 degrees. After being in NY, where a day pass on Citibike cost over $10 (with tax), the $6 day charge for Hubway felt like a bargain. Some readers may disagree, but, having biked in many cities, I consider Boston drivers the worst. Despite some of the most extensive signage, I really don't like riding on major roads in Boston unless they have a designated bike lane. 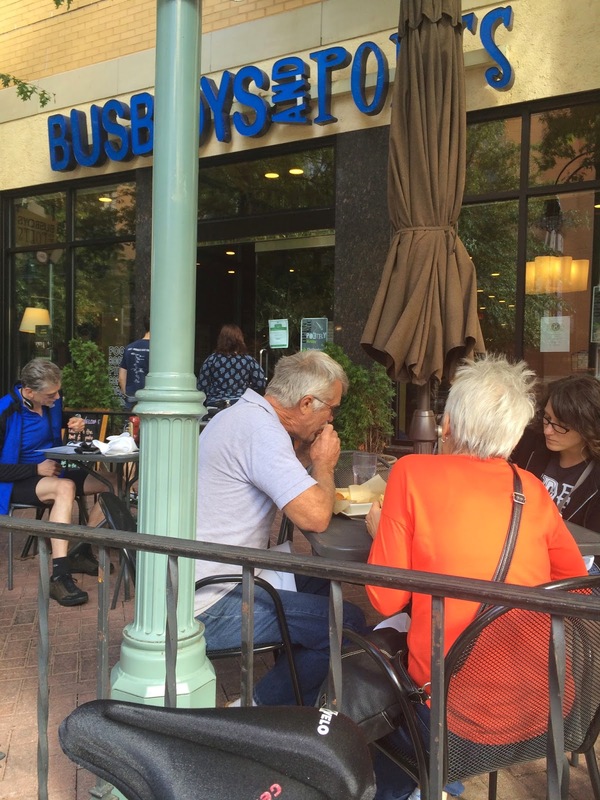 Fortunately my blocks on the very busy Beacon street were few, and I was able to head north on the aptly-named Pleasant Street to Blue State Coffee on Commonwealth Ave. 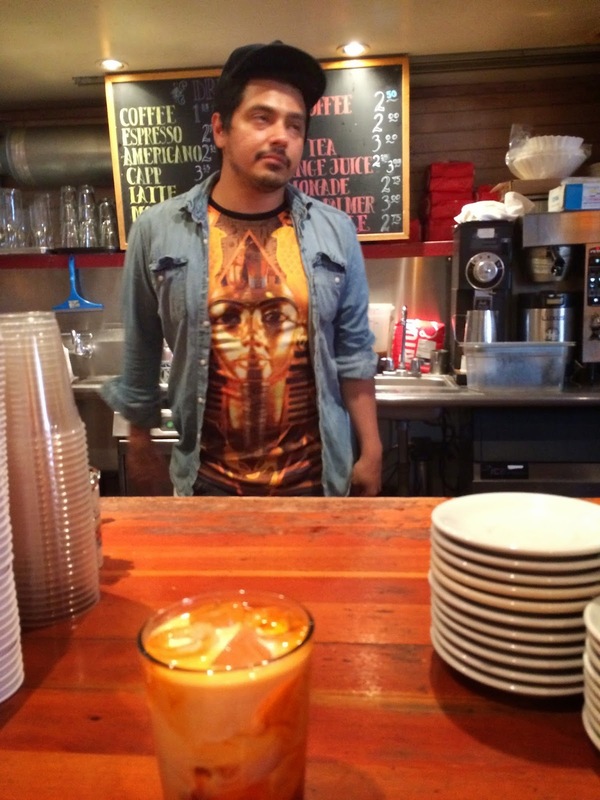 I arrived just as they opened at 7 and asked the barista what drink would best showcase their "best-in-Boston" status. He suggested a cappuccino. Indeed, it was smooth, creamy, and full-flavored, without a hint of bitterness. The only downside of my adventure was that the ride was too short. I wanted to spend the morning riding around, and would have loved to ride to my meeting at Boston College - but, alas, the Hubway system doesn't extend that far west. So I returned to my room for yoga and a shower before my meeting. The docking station was completely empty, so I imagine another rider nabbed my returned bike within minutes. Saturday morning was a rainy mess, so I decided to wait till today for my expedition. Sunday turned out to be one of those perfect biking days: low 60s, clear, and crisp. I biked to yoga and taught my two Sunday morning classes (still waiting for @coffeeneur to show up at Sun and MoonArlington some Sunday morning). It was so gorgeous I decided to bike from there to Georgetown. My mom had sent me a check for my birthday (which is tomorrow). Even at 62 I guess I’m not too old! So I went to Athleta, where I get a generous 30% teacher discount, and my birthday check was enough for two brightly-colored (are you happy Cycling Yogi) cool-weather tops. 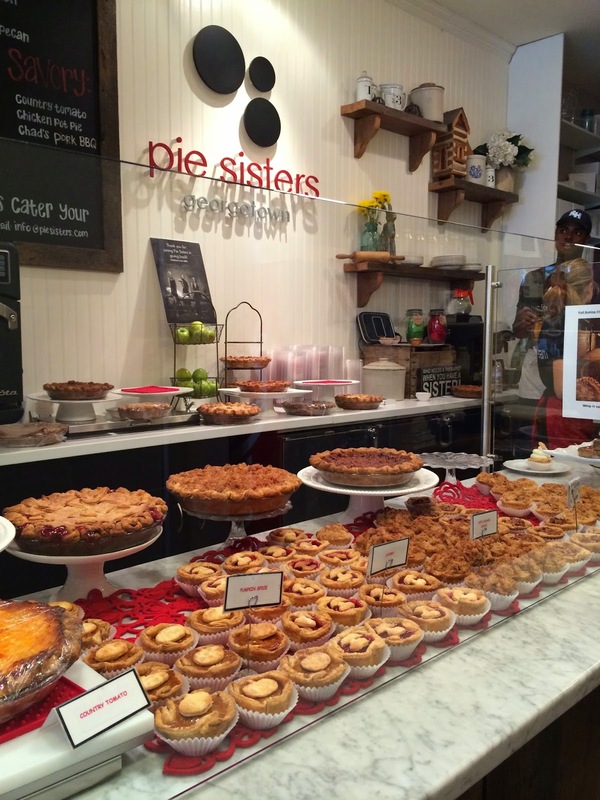 Coming across Key Bridge I spied Pie Sisters and decided to add a little sweetness to my hot beverage. 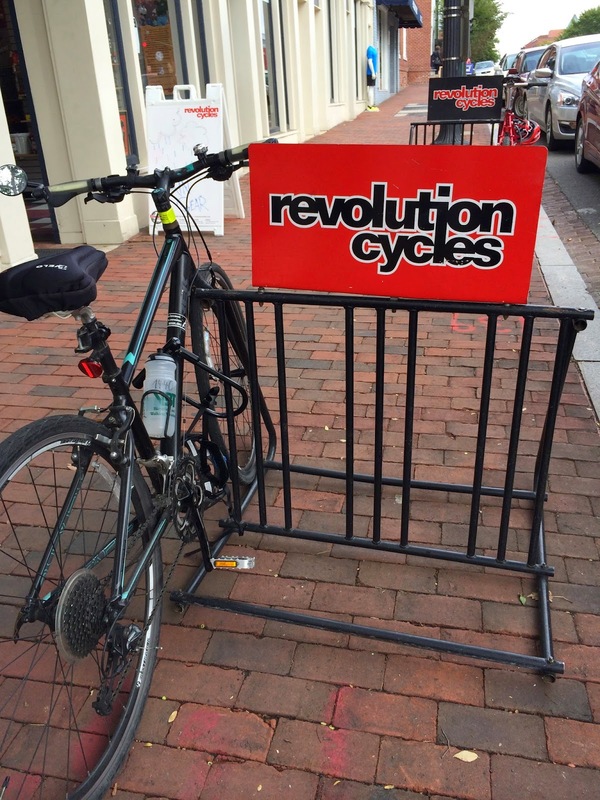 Luckily, Revolution Cycles is right next-door, and they provide two bike racks – possibly the only ones in all of Georgetown. It was a hard decision, but I chose a key lime tart, accompanied by ginger-lemon tea. 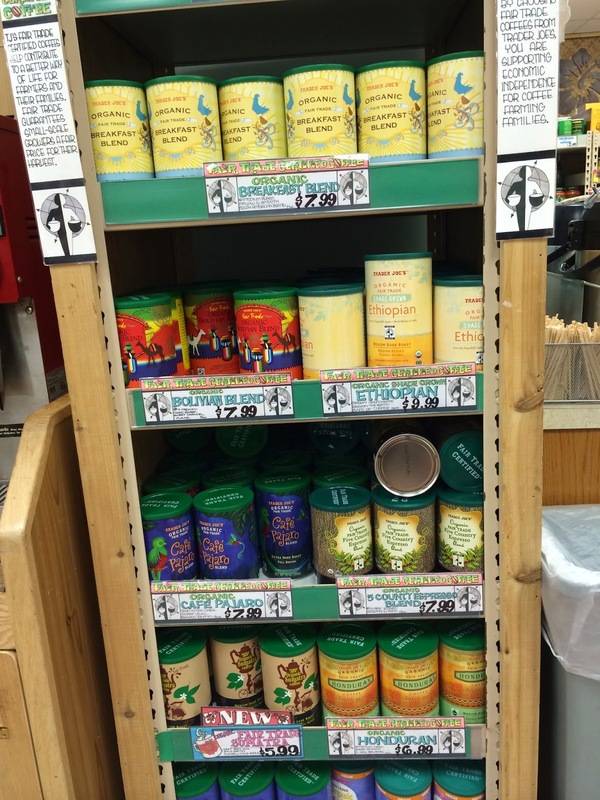 I ordinarily buy Yogi brand at home, but I must admit – they served Stash, and it was superior. Fueled by sugar and whipped cream, I headed home along the Custis Trail – an uphill climb that I usually avoid at all costs. But today I had magic pedals. The uphill stretches didn’t seem so bad and I never even got to my lowest granny gear. Maybe 62 won’t be so bad. I’m in San Jose this week for an anti-aging conference. It’s a town with a high cost of living, and I’m grateful to be able to stay with my friend, Dianne, about 10 miles from the Hyatt Regency where the conference takes place. What a great opportunity to commute by bike! So I called in advance to ask Dianne if she knew anyone with a bike I could borrow. No luck, but she suggested the urban bike share program, new to San Jose. Trouble with that solution is that they don’t extend out as far as the Hyatt. If you keep a bike more than ½ hour, the penalty is prohibitive. Dianne referred me to a bike rental shop at the other end of town. The trouble there is that they cater to the high-revenue market of sport enthusiasts, rather than commuters. They rent bikes by the day, but they’re more expensive than a car rental (which in San Jose is unusually cheap). So I found a friendly smaller shop near Dianne that specializes in repairs and sales of used bikes. Over the phone, they described for me a vintage 1983 Schwinn World Sport, which Chuck said might be large enough for me. At $100, it was priced so I could buy it and then either sell it back, or leave it in my mother’s garage, 70 miles down the coast, so I can use it in the future when I visit her. Chuck reserved it for me on my word, without asking for a credit card. These classic Schwinns were built to last forever, but not for convenience, not for comfort, and certainly not for light weight. It’s carbon steel throughout, a quilted plastic seat with springs underneath, no quick release wheels or seat post, requiring crescent wrenches rather than Allen for all adjustments. But a significant advance over the Schwinns of my youth, that had welded steel frames (no lugs) and cranks with cotter pins. I’m moderately tall, but the place where I have trouble fitting a bike is that all my height is above the waist. I look for a bike with a long top tube, then use a long stem combined with bar ends to get a comfortable reach. When I’m buying a new bike, I can always find a good fit, but in the As-Is used bike market, I have to get lucky. For $100 and my limited needs, I thought it was the appropriate technology. The top tube and stem were not quite long enough for me, but with a little help from Chuck we devised an innovative modification--no replacement parts--that gave a longer reach. We rotated the old-style handlebars (designed for sitting comfortably upright) 180 degrees around so they are low and forward. It’s not ideal. It feels a little unstable, and I have to reach a little for the brake handles, which are on backwards. The shifters are nowhere near my thumbs, and I just let go of one hand to reach for them. (Luckily, my route is pretty flat, and I’m not shifting much.) What I get for these inconveniences is a comfortable and efficient body position, leaning forward in the posture to which I’m accustomed. California is such a mixed bag. On the one hand, it’s a progressive state, full of people who pride themselves in independent thinking, self-sufficiency and fitness. The dry, mild climate is inviting, and the human ecology is bicycle friendly. But the whole concept of California is inseparable from automobiles. Eastern cities were laid out in the 18th and 19th centuries, when people got around on foot and in horse-drawn carriages. California cities were planned with car commutation in mind. Everything is designed for ease of auto access. It’s roughly true that Eastern cities were planned for human-scale transportation, and cars were retrofitted, while Western cities were planned around cars. And with the explosive growth in popularity of cycle-commuting in the 21st Century, they’re now retro-fitting for bicycles. San Jose is at least an organic community, settled in the 19th Century, with residential areas and a downtown area. Santa Clara, where the conference is held, is just a zip code with freeways, malls, and industrial parks. There are no parks, no sidewalks, and it’s alien territory for a pedestrian. So I found (Google maps found) two lovely bike paths on my 10-mile commuter route, totaling about ⅔ of the total distance. This is a picture from the Guadaloupe River Park Bike Path. I note with amusement that what passes for a “river” in this state is any sandy ecosystem threading through the plain that is wet at the end of a downpour, at least once a year. In August, the Guadaloupe River is water-free geologic formation. So I appreciated that this city has built bike paths, but they aren't connected to each other. What a mess! There are cyclists risking their lives on roads where cars are whizzing by at 50 MPH just a few feet away. No sidewalks, and yes! there are marked bicycle lanes on the shoulders of these boulevards with timed lights where the cars are zipping by, close enough to raise my adrenaline levels and the hairs on my neck. In the evening, on my way home, the GPS was spotty and I tried to retrace my route from memory. When I missed a turn, I spent more time on the hiway and less time on the bike path. I found myself on roads that had no bike lanes and no sidewalks, and other roads that had bike lines but shouldn't have. The worst moment was on a road where cars were zipping along at 50 or 60, I was in a nominal bike lane on the right and then the bike lane disappeared, traffic crossed onto a freeway on-ramp, and the bike lane re-appeared 50 yards up ahead. ...which brings me to the anti-aging conference, and what I’m learning that fits on the Biking Yogini page. Yogis and Asian sages have a reputation for longevity that goes back thousands of years. Now there are studies relating meditation to biomarkers of long life. Gradually, science is validating what ayurvedic medicine has known for centuries. I learned today that lung elastic fibres are among the few tissues that are never replaced, and must last a lifetime. And that the small-particle particulate pollution from diesels accelerates brain aging. A study of heart disease in LA found higher rates in the areas most exposed to smog, and particulate pollution was associated with thicker carotid arteries, a warning sign for heart attacks. This is a message I have yet to absorb. I’m accustomed to thinking of bicycling as personally healthy, and not just environmentally responsible. I don’t want to think that my lifelong habit of cycling in traffic is shortening my life, or rotting my brain and lungs. Does the benefit of the exercise trump the cost of the pollution? It may be a difficult question for science to answer, and I don’t want to think about it. The second day commuting to the conference, I discovered that the Guadaloupe River path goes another 4 miles beyond where it looked like it ended. Now I don’t have to go out on the hiway, and almost 8 miles of my 10 mile commute are on the path.